It’s hard to believe we’re nearing the end of week 2 in our 21-Day Clean Eating Breakfast Challenge <— psst: if you have no idea what I’m talking about, click here. BUT we are rockin’ it, enjoying a tasty, new protein smoothie, chia pudding, or overnight oats recipe every morning. 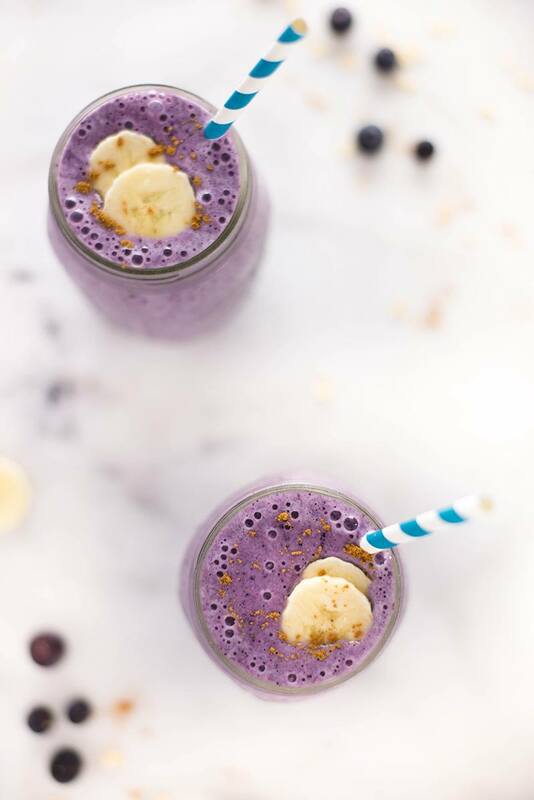 This week, we had THIS Blueberry Muffin Protein Smoothie for breakfast and I’m still swooning. OMG so much yumminess in a mason jar. I mean — see: look at what’s in it…. So simple, yet so delicious. Plus — you know — all those other good things, like high protein, no added sweeteners, no processed junk, clean eating, and other goodness. 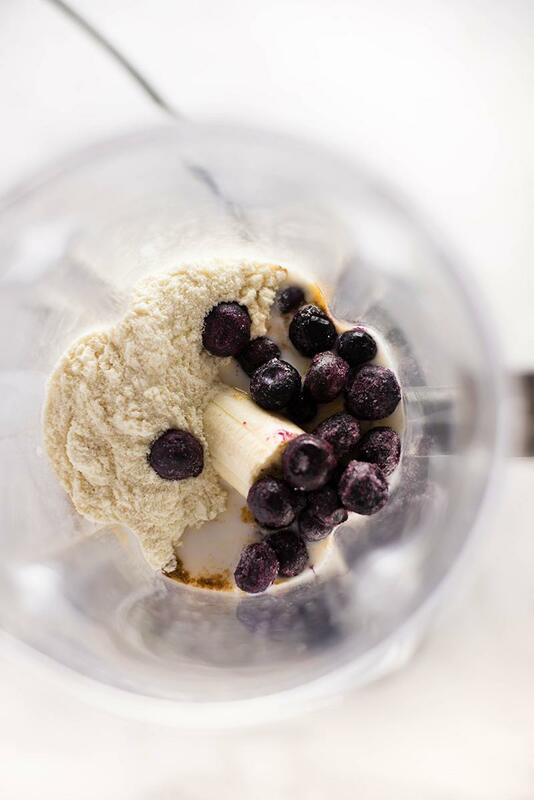 This means you can get unflavored or vanilla flavored protein powder and make any kind of protein shake on this blog. 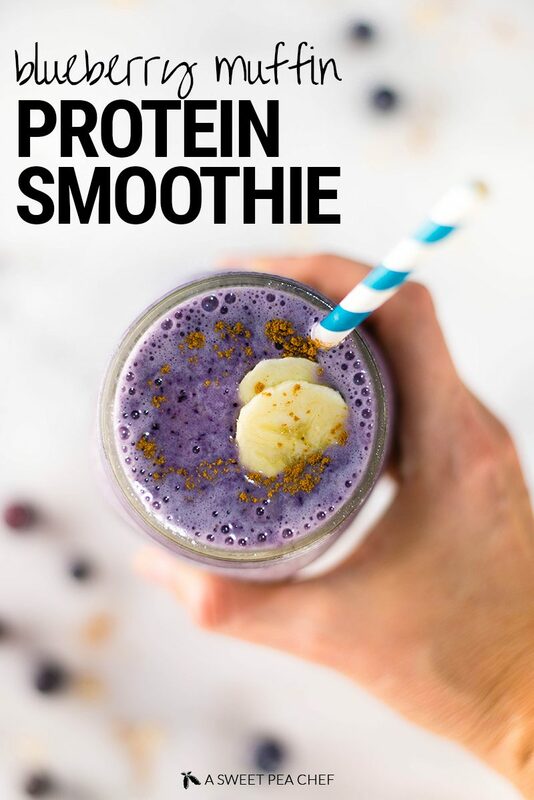 Basically, peeps, if you like blueberries, blueberry muffins, sweet goodness, delicious fruity yumminess, and/or protein shakes in general, chances are you’re gonna LOVE this blueberry muffin protein shake. 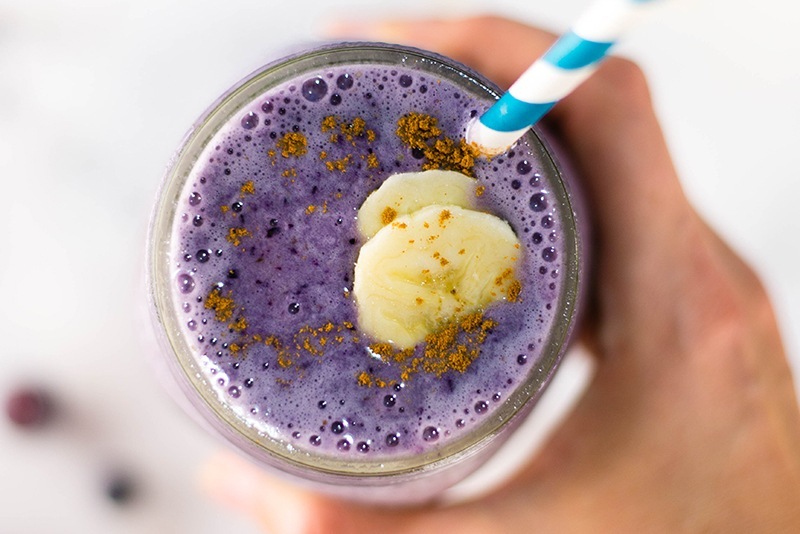 It’s like a blueberry muffin got all rolled up into a delicious, high-protein breakfast shake. Nom. P.S. It’s not too late to join the free 21-day challenge. You can sign up now to get the last week of recipes and join in on the healthy breakfast party! Click here to join us! 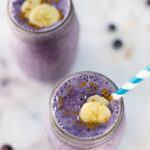 This Blueberry Muffin Protein Smoothie has all the yummy flavors of a blueberry muffin packed into a healthy, high protein breakfast shake. 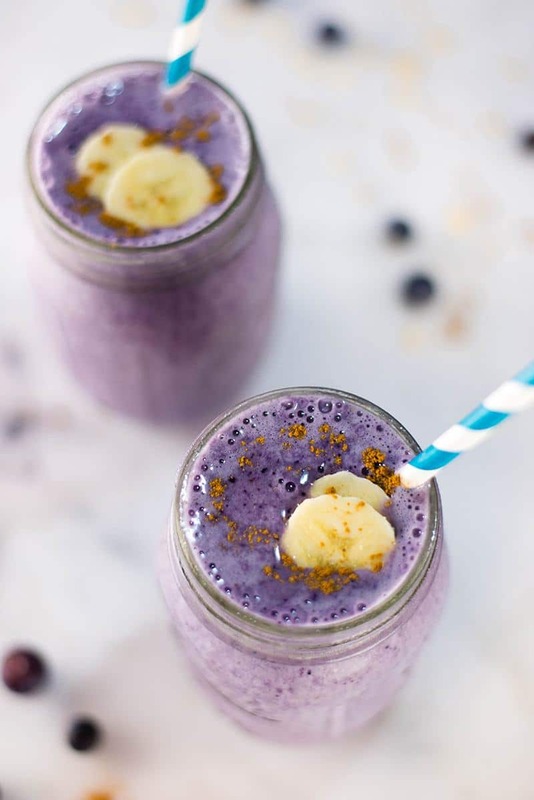 Add the unsweetened almond milk, frozen banana, rolled oats, plain greek yogurt, vanilla extract, ground cinnamon, frozen blueberries, and scoop of protein powder into a blender. 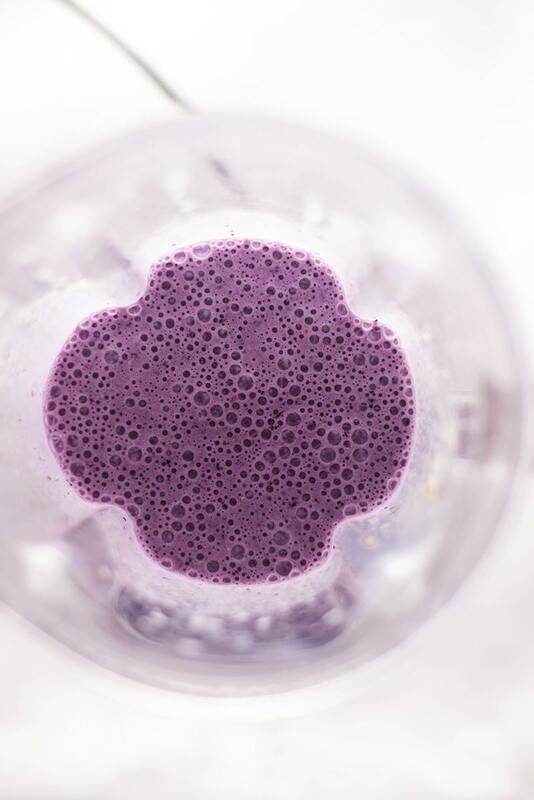 If you find your shake is too thick, you can always add some more almond milk, little by little or a little bit of ice to get it thicker, if necessary. Hi there! This looks super yum and very easy, but I hav3 a question: It calls for a 2 minute prep time and a 2 minutes cook time. Do I really need to cook it? Or is that how long I need to blend it? I made this recipe for my husband and & I. I added 2 cups of spinach to it too. It was so delicious! We both loved it! 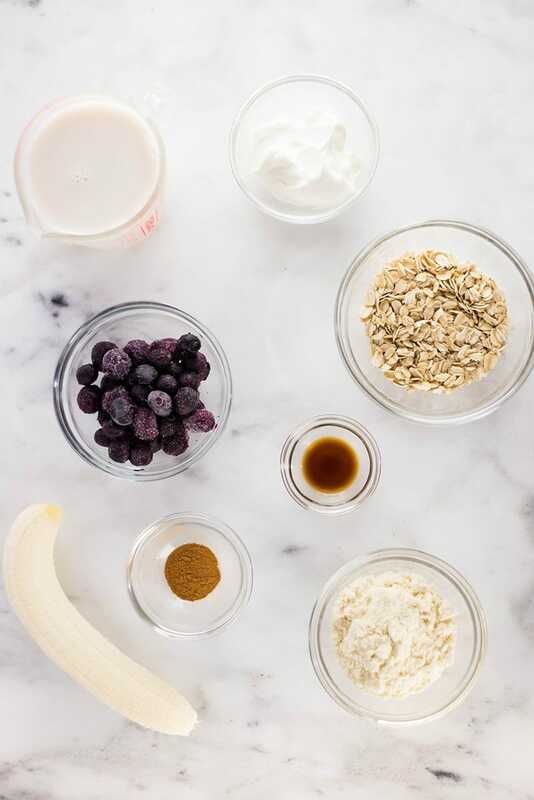 Then remove the oats and banana. Either way, look for solutions instead of being a debbie downer.